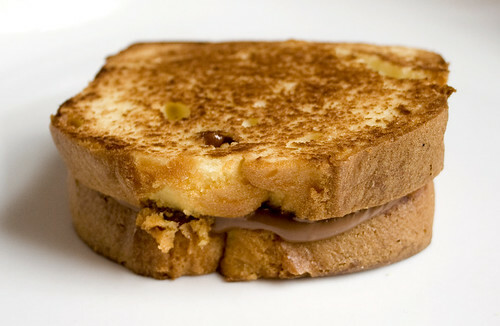 This may look like your average ordinary toasted sandwich on first glance, but the “bread” is actually pound cake. Yes, I’m afraid we may have hit a new caloric high today on The CPB Gallery. Well… this crazy person, apparently. I had all of the ingredients on hand and decided to give it a go – for the purpose of blog research, of course. Taste Tester and I had previously snickered at the overly-indulgent-sounding recipe, so I was sure he’d scoff at seeing me prepare it. To my surprise he happily helped me eat it. Then to my greater surprise, after it was gone he asked for another one. I think my point here is that these are good. The melted milk chocolate goes really well with the creamy pound cake. The sandwiches are definitely best served right off the skillet while they’re warm and crispy. If the calories scare you, know that we are all for a balanced diet but also believe that it’s okay to splurge on indulgences like this every so often – as long as they are yummy and worth it! Now I think I’ll be eating salad for dinner… for the next 3 days. 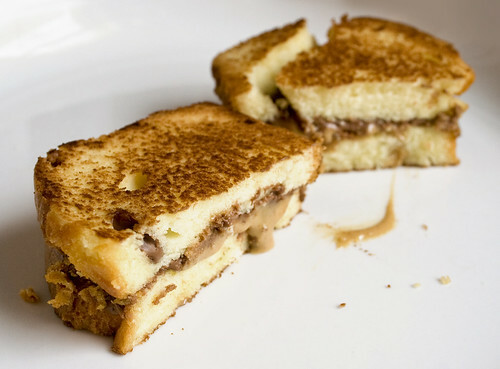 When I googled the recipe I came across this variation which is basically a pound cake fluffernutter panini dipped in melted chocolate. Whoa. 1. Butter the pound cake slices. Place 2 slices, buttered side down, on a work surface. Top each with 2 tsp peanut butter and 1 Tbsp melted milk chocolate; top each with 1 slice pound cake, buttered side up. 2. Heat a medium skillet over medium. Add sandwiches and cook, flipping once, until golden brown, about 3 minutes per side. Slice each sandwich into 4 pieces and serve warm. Those are some pretty over-the-top sandwiches, eh?! But, oh so good. :-) When I saw that variation in F&W I had to try it. Just saw the Everyday Food one too this past month. Pretty amazing!